US diplomats driving round London have racked up a gigantic bill in unpaid congestion charge fines, amounting to more than £300,000 in 2017 alone. There is no indication Donald Trump will settle the bill when he visits next year. According to the Independent, American diplomats were handed 2,633 penalties in the past year. Of these, only 31 have been paid, meaning the US embassy owes a whopping £317,265 (US$425,000) for congestion charge notices in 2017 – a daily average of £933.13. Transport for London (TfL) argues it is a tax for a service, something from which diplomats cannot be exempt. Yet it claims a “stubborn minority” of missions “refuse” to pay it. The latest figures bring the total owed to the UK by the US embassy to £11.9 million for the tens of thousands of penalties accumulated over the years. The Foreign Office claims it has made every new ambassador of missions that have failed to pay the fee aware of the £11.50 levy, which if unpaid can lead to a standard £130 penalty charge notice (PCN). That goes up to £195 after 28 days if it remains unpaid. Yet is has stopped short of saying whether it has also informed President Trump, who is due to visit the UK at the end of February despite widespread opposition. “The Foreign and Commonwealth Office has held meetings with a number of missions about unpaid congestion charge debt,” a spokesman said. Relations between the US and UK have recently soured after Trump condemned Prime Minister Theresa May for criticizing him over his resharing of Islamophobic videos on Twitter. The US leader said May should focus on “extremism” rather than his social media. The pair were also at loggerheads over the Boeing and Bombardier court case earlier in 2017. 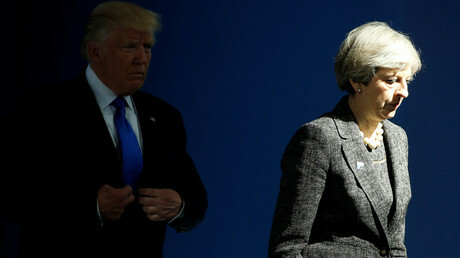 May pleaded with Trump to intervene as Boeing accused Bombardier of being unfairly supported by the Canadian government over its C-class planes. Trump refused and the US added huge tariffs to the cost of the planes, meaning thousands of jobs in Belfast are now at risk.